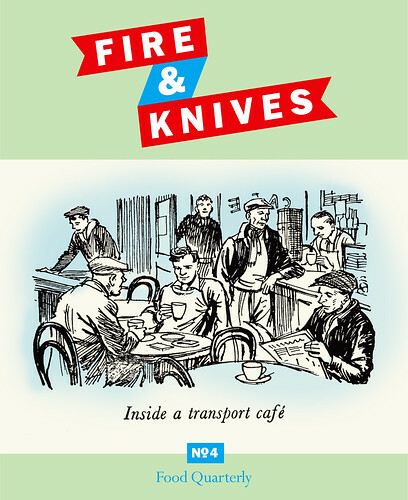 London Metblogs » Fire & Knives: Issue 4. Fire & Knives: Issue 4. One of the advantages of having a very interesting boss, is that you tend to find interesting things lying around the office/warehouse. One of those recent things was Issue 3 of Fire & Knives, a lovely food quarterly that began publication in November last year. Issue 4 is slated for imminent release, while I understand that copies of Issue 3 are still available in Foyles and Magma Books. There’s a fairly obvious degree of inspiration coming from the guys at MeatPaper magazine in San Francisco, but this is duly noted on the inside cover, and takes nothing away from the London publication. While you’re waiting for Issue 4, it’s probably a good idea to sit back and enjoy an espresso. Now… what to serve it in?